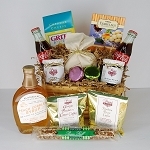 This basket is perfect for any chocolate lover, especially for any fan of the famous Ghirardelli brand chocolates. These tasty chocolates come in a beautiful red tin, which can be reused for anything at home (and that's always a plus, right?). This basket comes with 9 lovely Dark Chocolate squares, and 9 delicious Dark Raspberry Squares. We create our No Sugar Added Marble Truffle with a layer of our rich, delicious, sugar free, flour-less chocolate truffle cake which is topped with a layer of our wonderful, no sugar added cheesecake then swirled with a bit of chocolate on top. The combination results in a flour-less cake that is the perfect blend of rich sinful chocolate balanced with cool creamy cheesecake. Kosher Dairy Certified. 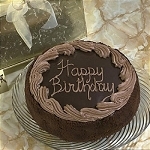 This cake is a wonderful sugar free options for that special someone in your life. Cuddles, Kisses and sweet smells show how you care for her this Valentine's Day. For those women in your life who don't enjoy candies on Valentine's Day, get her a mini spa at home and some relaxation from the businesses that is every day life. This comes with these from the Rosewater Jasmine Spa Set: Shea Butter Lotion, Bar Soap, Sweet Plush Bear, and Red Velvet Cookies. This soothing spa set is sure to please your loved one this Valentine's Day. You can't go wrong with a classic gift of perfect Starbucks proportions! A natural Kraft box adorned with the Starbucks logo holds two Starbucks ceramic mugs and Starbucks Breakfast Blend, House blend and Pike's Place coffees. This gift also includes hot cocoa, Walker's shortbread medallions and shortbread fingers, gingerbread biscotti and caramel wafer. Classically Starbucks! Perfect Valentine's Gift for any and every coffee lover in your life. Their hearts will fill with love and affection when they receive this bright tin filled with sweets of all kinds. Lemon cookies, tea cookies, Ghirardelli chocolate squares, Godiva heart themed truffles, cashew Roca and chocolate hearts. This basket offers a variety of flavors for the two of you to share this Valentine's Day.